The evening started with a warm introduction of our guest speaker, Dr. Nila G. Betof, by Kalpana Ramakrishnan from KPMG. Kalpana has worked with Dr. Betof over the past 15 years. 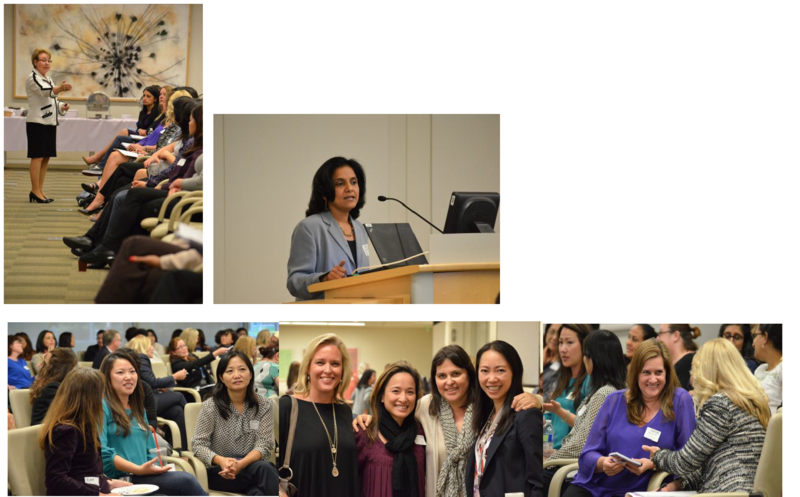 KPMG sponsored tonight's WITI OC's event. Our guest speaker, Dr. Nila G. Betof, Ph.D., is the Chief Operating Officer of The Leader's Edge/Leaders By Design. Dr. Betof has extensive experience in executive coaching working with leaders in the C-Suite though emerging talent and has over 30 years of operational and management experience. Dr. Betof is the author of numerous articles and has published a book for transitioning leaders called Just Promoted! A 12-Month Roadmap for Success in Your New Leadership Role. Communication is a skill that is learned and once learned you have the skill forever. As you explore it and do it well, it will improve many areas of your life. First, let's touch on how women are doing today. 85% of all consumer products purchases are influenced by women. And 60% of all personal wealth is managed by women because they are earning their own wealth. With this significant leverage on the economy, this is not translating into women moving up or advancing in their career in Corporate America. Dr. Betof referred to a research firm, Catalyst, who specializes in studies on women. Their website is www.catalyst.org and has an extensive amount of research to share. One of their pieces of research shared was a chart regarding U.S. Women in Business Pyramid. This research showed that women make up 51.4 % of all management level professionals. However the one level up to executive officers, the percentages drop to only 14% of the total. The higher up on the corporate ladder, the smaller the percentage of women in higher level groups, such as Board of Directors and CEOs. Dr. Betof mentioned that we are seeing trends of more women moving up. She commended KPMG, who has named not only a new women president but a women CEO and recruited another women from their competitor. We must commend them for helping to ensure women have the opportunity to be in these positions. Why such disparities between women's significant leverage on the economy yet so little of them are moving up in their careers? When asking male executives, they responded that women don't have enough general management experience. They are not line management positions with P&L responsibility. And they responded that it is due to the fact that women have not been in the pipeline long enough. However women have been in the corporate environment since World War I! If you ask women, they responded that there still is a male stereotyping and preconceptions about what they want. And they respond that they are excluded from informal networks, which is a major element in building careers. They point to the fact that they are not being offered those positions of line management. The message is that women need to build the skills that help them move forward to higher level positions, but how? Dr. Betof asked the audience what was meant by Organizational Savvy? One attendee said 'Culture'. And culture within an organization needs to be understood and the value that comes along with it. The second item was 'Circle of Influence'. These are the people within your organization who are stakeholders, can help empower you to advance in your career, mentor you and have a vested interest in your success. - who holds the power? These are all elements that are important to know along with the culture of the company. Knowing what helps people move in the organization will be the key to knowing what steps a woman needs to take and how to navigate within her organization. Dr. Betof shared an Organization Savvy model which is the political behavior on a continuum. The chart showed the less political traits on the left, which describes the politically naïve. They have a high level of integrity but they don't have the political skills to move within the organization. Then to the right side of the chart is the highly political. This behavior is more self-serving and only focuses on the individual. They have the lowest integrity but a high level of political skills. The most-savvy leader is right in the middle of the continuum. They care most about the organization, shareholders and customers. They have a high level of integrity but also have the political skills to get an idea to move through the organization, which can be more difficult the more people and opinions there are. The question often asked is "Do I have to give up my values to be political?" and this shows that you can still use your influence to move up in the organization without losing your values. It is not new to know there is a gender difference with the way men and women think as well as how they communicate. Dr. Betof shared a story of a man and woman discussing an event and women will describe things with much more detail than men. On average women use an average of 750 more words than men at any given time. This explains a key element to the communication differences between men and women. Also, biologically the brains operate different. For the most part, men use the left side of their brain, which is the more logical, detached from emotion, can solve complex and conceptual problems, while focusing on one task at a time. For the most part women will use the right side of their brain which is the more creative and intuitive, empathetic, collaborative, big picture, and optimistic. The major difference in how men and women use their brains is that men are more compartmentalized and are able to keep things very separate. Women blend all areas together which allows them to multi-task mentally where men will think of one area at a time. They can be creative but need to shut off the logical, more scientific side of the brain to then think creatively and collaboratively. It is knowing this difference that will allow women to adjust their communication in order to get their thoughts heard. A video was shared that showed two types of the same conversation between a male and female colleague in an office. When the woman was too wordy and emotional about her point, the male colleague couldn't focus on the point. The more he seemed unengaged, the more the female tried to make the point by speaking higher and faster until communication just ceased. The second example was a more succinct conversation, in which she gave him the 'headline' or summary of her point first, then quickly got to the point, in a lower tone and even paced voice, the message was heard. In fact, the male counterpart asked for a follow up on status. This is an important element to ensure ideas and directions are communicated. Dr. Betof also cautioned women to not use discounting language such as 'not sure', or 'you may not agree' or asking questions, to saying things more directly like 'I believe', 'Here's an idea' and Let's move forward with... ". This will create more confidence by those listening. And speaking assertively is a balance between aggressive and passive. Always be direct and clear, while checking for understanding. One of the most important messages of the presentation from Dr. Betof is the element of confidence we have in ourselves. It is critical to have a positive belief in our abilities, actions and decisions. This will allow us to speak up in meetings. When women are the minority in a meeting, they will speak 75% less of the time then the men in the meeting. This is a missed opportunity for a woman to show her ideas and ability to take an initiative forward within an organization. Also women need to be confident that it's not about being 100% perfect. Men will tend to apply for a job if they only meet 60% of the qualifications yet women will only apply if they meet 100% of the qualifications. This is another reason why women will not reach out for positions rather than wait to be offered. Lastly, the importance of storytelling was the closing element to Dr. Betof's presentation. Stories are the best way to convey an idea or initiative because of the impact they have on the brain. Stories are a narrative of an event or situation that explains why and how things are. It's a way of sharing that leaves a lasting impression because when listening to a story, both the right and left sides of the brain are activated and the right side, or the creative side, is engaged and stimulated. This allows others to also contribute and remember. Keeping a journal of stories will allow you to have them ready when needed. Stories can be shared from other stories, and they remind people of your goals in a fresh way. Stories share a vision, they make a connection, explain intentions, and company stories create culture. Networking needs to be considered a part of your job and will allow you to gain more stories. Networking is important to your company because it allows for you to bring external expertise into the company. And it's important to you to bounce ideas off others in the same industry or professional communities and allows for strategic relationships both internal and external to your organization.